Sandhill Crane Vineyards in Jackson will host live music by Jason Dixon, 6:30-8:30 p.m., as part of its Thirsty Thursdays series. The winery is open 6-9 p.m., with the café kitchen closing at 8:45 p.m. Admission is $5 and reservations are encouraged. Wine is available for purchase by the glass or bottle. For more information, visit http://www.sandhillcranevineyards.com. Michigan By The Bottle Tasting Room in Shelby Township (Metro Detroit) will host live music by Chris Degnore, 7-9:30 p.m. There's no cover charge, and we're open to the public as usual! For more info, visit http://www.MBTBTasting.com or call (586) 843-3690. Bowers Harbor Vineyards will host its first dinner inside its recently renovated tasting room, featuring Bowers wines and multiple courses by Chef Bradford Lewis of Food Forward. The cost is $75 per person and includes tapas, courses, wine, tax and gratuity. Space is extremely limited. Call (231) 223-7615. Sandhill Crane Vineyards in Jackson will host this festival 10 a.m.5- p.m., featuring colorful yarn, fiber, knitted items and knitting supplies. Various vendors will be onsite, the café will be open and you're welcome to bring your knitting, crocheting or spinning and relax with wine. Admission is free; wine tasting is $5. For more information, visit http://www.sandhillcranevineyards.com. Chateau Chantal on Old Mission Peninsula will host this cooking class with Chef Les Hagaman, focusing on making meals that can accommodate a range of allergies and dietary restrictions. For more information, visit http://www.chateauchantal.com. Mackinaw Trail Winery in Petoskey will host a Winemaker's Tapas Night, 5:30-8 p.m., featuring six wines paired with tapas. Winemaker Dustin Stabile will discuss the creation of each wine, and Chef Joseph Krumholz will explain the inspiration behind each small plate. The cost is $60 per person; seating is limited. For more information or reservations, call (231) 487-1910. Tickets also available at the winery or at the Gaslight District Tasting Room in Petoskey. Kandy Myny, the featured artist for January and February in the rotating hallway gallery at Michigan By The Bottle Tasting Room in Shelby Township, will be here to chat with visitors about her work. Come out to met Kandy and check out her pieces from Bit o' Whimsey Design Studio. We'll be open to the public as usual during this event. Can't make it today? Her art will be on display and available for purchase through the end of February. For more info, visit http://www.MBTBTasting.com or call (586) 843-3690. Sandhill Crane Vineyards in Jackson is teaming up with certified yoga instructors Amy Reamer, Laurie Lewis and Kim McGowan for evenings of yoga, wine, cheese and chocolate, two Tuesdays a month at 6:30 p.m. The cost is $25 per person. For more information, visit http://www.sandhillcranevineyards.com. The Cooks' House in Traverse City will host a dinner featuring the wines of Left Foot Charley. For more information, visit http://www.thecookshouse.net. Take part in wine tasting and a little more during Black Star Farms' new Digs & Swigs events. The theme for this session is "Holiday Photo Gone Bad," with attendees encouraged to bring their embarrassing holiday pics of years past. Guests will receive free samples of Eau de Vie spirits. For more info, call (231) 944-1271 or email clopez@blackstarfarms.com. Sip while you shop! We'll have various vendors onsite at Michigan By The Bottle Tasting Room in Shelby Township 5-9 p.m. selling jewelry, apparel, bags, home decor, snacks and more! We'll be open to the public as usual during this event. (Tastings will be on ticket system due to event popularity.) For more info, visit http://www.MBTBTasting.com or call (586) 843-3690. Sandhill Crane Vineyards in Jackson will host live music by Mark Sandstrom, 6:30-8:30 p.m., as part of its Thirsty Thursdays series. The winery is open 6-9 p.m., with the café kitchen closing at 8:45 p.m. Admission is $5 and reservations are encouraged. Wine is available for purchase by the glass or bottle. For more information, visit http://www.sandhillcranevineyards.com. Sandhill Crane Vineyards in Jackson is the Jackson County venue for "Legacy of the Land Through Art," a mixed media juried exhibit celebrating the area lands that are protected by the Legacy Land Conservancy. The opening reception is 5-7:30 p.m. Jan. 31; the exhibit runs through March 9. During the reception, the winery will release the new vintage of Legacy, a dry Chardonnay/Vignoles blend. Reception admission is $35 per person and reservations are recommended. The ticket price is a fully deductible contribution to the Legacy Land Conservancy, and the winery will donate 10% of all wine sales that night to the conservancy. To make reservations, call (734) 302-5263. Grand River Marketplace in Jackson will host live music by Ben Daniels Band, 8-10 p.m. For more information, visit http://www.grandrivermarketplace.com. Gill's Pier on Leelanau Peninsula will host this pre-Super Bowl Party put on by the Northern Wine Loop, with free wine tasting, snacks and great company! For more info, visit http://www.gillspier.com. Our friends from Maria's House Made Salsa will be back at Michigan By The Bottle Tasting Room in Shelby Township for part of the day with samples of their delicious, fresh, Michigan-made salsas, including Roasted Habeñero, Mango Cranberry, Smoked Ghost Pepper and Roasted Black Bean & Corn. It's a great time to stock up for Super Bowl Sunday! We're open to the public as usual during this event. For more info, visit http://www.MBTBTasting.com or call (586) 843-3690. Ski the trails, warm up with mulled wine and sample delicious goodies at this annual event at Black Star Farms in Suttons Bay. For more info, visit http://www.blackstarfarms.com or http://womenswintertour.com. This dinner at the Boathouse Restaurant on Old Mission Peninsula will feature wines from Bowers Harbor Vineyards and Chateau Grand Traverse, with all proceeds going to Bowers Harbor Park and Traverse City Little League. For reservations, call (231) 223-4030. The Towne Plaza in Traverse City will host a Tasters Guild of NW MI wine dinner featuring wines from Brys Estate. The cost is $50 for guild members; $55 for non-members. RSVPs due by Jan. 30. Email Karen Hill at rhill1129@yahoo.com. Sandhill Crane Vineyards in Jackson will host live music by Kitty Donohoe, 6:30-8:30 p.m., as part of its Thirsty Thursdays series. The winery is open 6-9 p.m., with the café kitchen closing at 8:45 p.m. Admission is $5 and reservations are encouraged. Wine is available for purchase by the glass or bottle. For more information, visit http://www.sandhillcranevineyards.com. Kick off the first Friday of each month at TASTES of Black Star Farms in Traverse City! Stop by and partake in their “Savor the Tastes & Flavors” experiential events with Managing Partner Don Coe. Learn first-hand about selected Black Star Farms wines along with complementary food choices. Wine and appetizers provided at each event, $3 per person and $5 per couple. For more info, visit http://www.blackstarfarms.com. Don Julin and Billy Strings will perform live music at Left Foot Charley in Traverse City, 6:30-8:30 p.m. Wine and cider will be available by the glass. For more info, visit the Facebook event page: https://www.facebook.com/events/1389825337939689. Cascade Winery in Grand Rapids will hold its annual Chili Cook-Off, with proceeds going to Bee Brave, a group that organizes an annual 5K race to benefit the Mary Kay Foundation. Tickets are $10 in advance or $15 at the door. For more info, visit http://www.cascadecellars.com. St. Julian's Dundee tasting room will host a fun and educational event that will allow guests to be the winemaker for the evening, creating their own Meritage blend with Braganini Reserve Cab Franc, Cab Sauvignon and Merlot. The cost is $15 for non-wine club members and $12 for wine club members and includes wine tasting and a cheese plate. RSVP by Feb. 5 by calling (734) 529-3700. The Cooks' House in Traverse City will host a dinner featuring the wines of Bowers Harbor Vineyards. For more information, visit http://www.thecookshouse.net. This annual event in Benton Harbor features a panel of master sommeliers leading guests through a tasting of wines from southwestern Michigan, along with world-class examples of wine styles from other wine regions that share similar characteristics. Guests taste the wines at the same time as the experts to get a first-hand appreciation of the wines' subtleties. At the conclusion, the panel will choose the best Southwest Michigan wine in each category and there will be a Q-and-A session. The cost is $75 per person by Feb. 1 or $90 per person after Feb. 1. For more information, call (269) 363-9334. Join registered yoga teacher Kindra Reck for a yoga class offering modifications for everyone from new to experienced yogis, followed by wine tasting and small bites. The $25 cost includes 60 minutes of yoga instruction, a Mini Tasting Flight (three 2 oz. samples of wine), Flight Bites (Michigan-made cheese and chocolate) and a $5 credit toward take-home wine purchases that evening. All levels are welcome. Space is limited. Call (586) 843-3690 to register; payment due upon booking to reserve your place. Please bring your own yoga mat if you have one; a limited number of extras will be available if you don't. 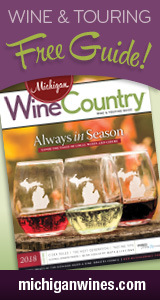 For more information, visit http://www.MBTBTasting.com or call (586) 843-3690. *This event is sold out. Call for wait list. Douglas Valley in Manistee will host live music, 6-8 p.m., on the first Friday of each month. Small food plates are available, along with wine tasting and wine by the glass. For more information, visit http://www.douglasvalley.net. Lawton Ridge Winery is among participants in the 2014 fundraiser for Volunteer Kalamazoo, held in the Arcadia Ballroom of the Radisson Plaza Hotel, 7:30-10 p.m. Tickets are $60 per person or $70 from Jan. 24 on. For more information, visit http://store.volunteerkalamazoo.org/SearchResults.asp?Cat=28. Black Star Farms will be among the Michigan wine and beer samplings available at this Char-Em United Way fundraising event at Castle Farms in Charlevoix, which benefits the Dolly Parton's Imagination Library. For more info, visit http://www.charemunitedway.org. On three select weekends in early 2014 — Jan. 10-12, Feb. 7-9 and March 28-30 — Grand Traverse Resort & Spa is teaming up with Bowers Harbor Vineyards to host VIP packages that include two nights' accommodations, two breakfast buffets at Sweetwater American Bistro, VIP tickets to Bowers for private tasting, VIP treatment and appetizers, and a $99 or less spa treatment at Spa Grand Traverse. Packages start at $254 per person in the hotel, $282 per person in the tower. For more information, visit http://www.grandtraverseresort.com/VIPwine. Lone Oak Vineyard Estate in Grass Lake will hold a candlelight dinner concert featuring Ian Stewart, 6:30-9:30 p.m. The cost is $25 per person for dinner and the show. Reservations are required; for more information, call (517) 522-8167. This annual event on Leelanau Peninsula celebrates wine, chocolate and love, with food and wine pairings and optional winter and Valentine-themed activities. Attendees can stop at any of the participating wineries 11 a.m.-5 p.m. Saturday and 12-5 p.m. Sunday. Tickets are $35 per person. For more information, visit http://www.lpwines.com/taste. As part of its Harvest Dinner Series, the Inn at Black Star Farms on Leelanau Peninsula will host a five-course meal featuring lamb and parsnips, served with complementary wines. Call (231) 944-1251 to make a reservation. Sandhill Crane Vineyards in Jackson will host live music by Dan Bickel, 6:30-8:30 p.m., as part of its Thirsty Thursdays series. The winery is open 6-9 p.m., with the café kitchen closing at 8:45 p.m. Admission is $5 and reservations are encouraged. Wine is available for purchase by the glass or bottle. For more information, visit http://www.sandhillcranevineyards.com. Sandhill Crane Vineyards in Jackson will celebrate Valentine's Day with a four-course meal, paired wine and live music. The cost is $40 per person and includes tax and gratuity. For reservations, call (517) 764-0679. For more information, visit http://www.sandhillcranevineyards.com. Michigan By The Bottle Tasting Room in Shelby Township will be offering $5 off the weekends after-hours price of the Tour for Two menu option, 6-10 p.m., in celebration of Valentine's Day! We're open to the public as usual. For more info, visit http://www.MBTBTasting.com or call (586) 843-3690. The Wineries of Old MIssion Peninsula is celebrating the Riesling varietal via its annual Romancing the Riesling event, 11 a.m.-5 p.m. The seven participating wineries will showcase one of their Rieslings, paired with food, along with a souvenir wine glass. Special promotions also are available at participating Old Mission-area restaurants. Tickets are $15 in advance or $20 at the seven wineries on the days of the event. For more info, call (231) 223-7355 or visit http://www.wineriesofoldmission.com/events/4. Lone Oak Vineyard Estate in Grass Lake will hold a candlelight dinner concert featuring Doug Decker and Tony Fields, 6:30-9:30 p.m. The cost is $40 per person for dinner and the show. Reservations are required; for more information, call (517) 522-8167. Join registered yoga teacher Cindy Neville for a yoga class offering modifications for everyone from new to experienced yogis, followed by wine tasting and small bites. The $25 cost includes 60 minutes of yoga instruction, a Mini Tasting Flight (three 2 oz. samples of wine), Flight Bites (Michigan-made cheese and chocolate) and a $5 credit toward take-home wine purchases that evening. All levels are welcome. Space is limited. Call (586) 843-3690 to register; payment due upon booking to reserve your place. Please bring your own yoga mat if you have one; a limited number of extras will be available if you don't. For more information, visit http://www.MBTBTasting.com or call (586) 843-3690. The Cooks' House in Traverse City will host a dinner featuring the wines of L. Mawby. For more information, visit http://www.thecookshouse.net. Salt of the Earth in Fennville will host a wine dinner featuring wines from Brys Estate, starting at 6:30 p.m. For reservations, call (269) 561-SALT. Sandhill Crane Vineyards in Jackson will host live music by The Gardener & The Wildflowers, 6:30-8:30 p.m., as part of its Thirsty Thursdays series. The winery is open 6-9 p.m., with the café kitchen closing at 8:45 p.m. Admission is $5 and reservations are encouraged. Wine is available for purchase by the glass or bottle. For more information, visit http://www.sandhillcranevineyards.com. Audra Kubat will perform live at Michigan By The Bottle Tasting Room in Shelby Township, 7-9:30 p.m. There's no cover charge. For more info, visit http://www.MBTBTasting.com or call (586) 843-3690. Grand Rapids artist Stephanie Schlatter, who created the colorful "On the Michigan Wine Trail" series on display in our main space, will be here to paint live! We'll be fielding pre-orders for abstract hearts on paper or wood block to be delivered this day, and Stephanie also will take orders on the spot for hearts to paint live. It's a great Valentine's gift! For all pre-orders, we're happy to make a personalized certificate to present to your loved one! Better yet, it's for a great cause: All proceeds will benefit Absolutely Art: A Project for Change and Ethiopia Reads, which help support education in Ethiopia. We'll be open to the public as usual during this event. Interested in more information or an order form? Stop by during our regular business hours or email us at tasting@michiganbythebottle.com.For more info on Stephanie, visit her website. Chef Christine Ferris will demonstrate easy cooking techniques during this event at Fenn Valley Vineyard & Wine Cellar in Fennville, 11 a.m.-2 p.m. This session will focus on sweet and savory cookies and shortbread. Tickets are $35 and include lunch, wine, tax and tip. Reservations are required. For more info, visit http://www.fennvalley.com. Lone Oak Vineyard Estate in Grass Lake will hold a candlelight dinner concert featuring Ian Stewart and Doug Decker, 6:30-9:30 p.m. The cost is $35 per person for dinner and the show. Reservations are required; for more information, call (517) 522-8167. Take part in wine tasting and a little more during Black Star Farms' new Digs & Swigs events. The theme for this session is "Oscar Mania," with attendees encouraged to cast their Academy Awards ballots while sipping sparkling wine. Bubbly purchase will be 20% off. For more info, call (231) 944-1271 or email clopez@blackstarfarms.com. Sandhill Crane Vineyards in Jackson will host live music by Bello Spark, 6:30-8:30 p.m., as part of its Thirsty Thursdays series. The winery is open 6-9 p.m., with the café kitchen closing at 8:45 p.m. Admission is $5 and reservations are encouraged. Wine is available for purchase by the glass or bottle. For more information, visit http://www.sandhillcranevineyards.com. Billy Brandt will perform live at Michigan By The Bottle Tasting Room in Shelby Township, 7-9:30 p.m. There's no cover charge. For more info, visit http://www.MBTBTasting.com or call (586) 843-3690. At Michigan By The Bottle Tasting Room in Shelby Township (Metro Detroit), we're teaming up with Argentine Tango Detroit in Utica for a night of wine and dance! Whether you have two left feet or can cut a rug with ease, it’s guaranteed to be a good time. The $25 cost includes a 45-minute lesson in the fun, comfortable style of the romantic Argentine tango, taught in a friendly manner with easy movements that can start you on any social dance floor, followed by a mini wine tasting flight. Additional wine samples and snacks will be available for purchase. Singles, couples, spouses, friends, relatives — all are welcome to register! Space is limited; call (586) 843-3690 to register with payment. Sandhill Crane Vineyards in Jackson will host live music by Jake Reichbart & Bradley McNett, 6:30-8:30 p.m., as part of its Thirsty Thursdays series. The winery is open 6-9 p.m., with the café kitchen closing at 8:45 p.m. Admission is $5 and reservations are encouraged. Wine is available for purchase by the glass or bottle. For more information, visit http://www.sandhillcranevineyards.com. The Wineries of Old Mission Peninsula will offer 20-30% off select wines and merchandise to make way for new wines (to be released in May) during this annual event. For more info, visit http://www.wineriesofoldmission.com. Ben Keeler will perform live at Michigan By The Bottle Tasting Room in Shelby Township, 7-9:30 p.m. There's no cover charge. For more info, visit http://www.MBTBTasting.com or call (586) 843-3690. Tom Butwin will perform live at Michigan By The Bottle Tasting Room in Shelby Township, 7-9:30 p.m. There's no cover charge. For more info, visit http://www.MBTBTasting.com or call (586) 843-3690. Lone Oak Vineyard Estate in Grass Lake will hold a candlelight dinner concert featuring Jill Jack, 6:30-9:30 p.m. The cost is $35 per person for dinner and the show. Reservations are required; for more information, call (517) 522-8167. St. Julian Winery in Paw Paw will celebrate St. Patrick's Day 2-4 p.m. with Irish small plates paired with St. Julian wines. Limited seating available. The cost is $15 for non-wine club members and $12 for wine club members. RSVP by March 12 to (800) 732-6002. The Cooks' House in Traverse City will host a wine dinner featuring wines from Brys Estate, starting at 6:30 p.m. For reservations, call (231) 946-8700. Take part in wine tasting and a little more during Black Star Farms' new Digs & Swigs events. The theme for this session is "Collegiate Spirit," with attendees encouraged to wear their collegiate logo gear. Free samples of tailgating-inspired cocktails will be available. For more info, call (231) 944-1271 or email clopez@blackstarfarms.com. Mark Jewett will perform live at Michigan By The Bottle Tasting Room in Shelby Township, 7-9:30 p.m. There's no cover charge. For more info, visit http://www.MBTBTasting.com or call (586) 843-3690. Fenn Valley Vineyards & Wine Cellar will host a Winemaker Dinner with a German theme. The event begins with a sparkling wine and cheese reception, followed by a multi-course dinner paired with wine. For more information, visit http://www.fennvalley.com. One of our most popular events! Isaiah Sonjeow and his team from Khom Fai: Thai Dining Experience in Shelby Township — named Best Thai Restaurant by Hour Detroit — will be back onsite to prepare a multi-course Thai tasting menu and discuss their techniques. Each course will be paired with wine samples. The $45 cost includes the meal, wine samples and a $5 credit toward take-home wine purchases that evening. (Gratuity not included.) Seating is limited. Call (586) 843-3690 to register; payment due upon booking to reserve your place. Menu TBA. For more info, visit http://www.MBTBTasting.com. Mark Reitenga will perform live at Michigan By The Bottle Tasting Room in Shelby Township, 7-9:30 p.m. There's no cover charge. For more info, visit http://www.MBTBTasting.com or call (586) 843-3690. Motor City Sax Quartet will perform live at Michigan By The Bottle Tasting Room in Shelby Township, 7-9:30 p.m. There's no cover charge. For more info, visit http://www.MBTBTasting.com or call (586) 843-3690. David Nefesh will perform live at Michigan By The Bottle Tasting Room in Shelby Township, 7-9:30 p.m. There's no cover charge. For more info, visit http://www.MBTBTasting.com or call (586) 843-3690. At all St. Julian locations throughout January, wine club members will receive a complimentary glass of sparkling wine: either Michigan Brut Champagne or Sweet Nancie. For more info, visit http://www.stjulian.com. Kick off the first Friday of each month with “Savor the Tastes & Flavors” experiential events with Managing Partner Don Coe at TASTES of Black Star Farms in Traverse City. Learn first-hand about selected Black Star Farms wines along with complementary food choices. Wine and appetizers provided at each event. The cost is $3 per person and $5 per couple. For more info, visit http://www.blackstarfarms.com. At all St. Julian locations throughout February, guests can enjoy a Hershey's Kiss and wine pairing, with staffers talking about how to pair chocolate and wine. The cost is $8 for non-wine club members; members are free. For more info, visit http://www.stjulian.com. Boathouse Vineyards in Lake Leelanau is bringing back its Saturday Cocktail Hour through the end of March, 5-7 p.m. Sit at the tasting bar, in a high-top chair or beside the fireplace while enjoying wine. For more info, visit http://www.boathousevineyards.com. Tour the winery at Tabor Hill daily, every half hour, noon-4:30 p.m. The tours are a casual walking affair through the vineyards and what Tabor Hill bills as "one of the most modern winemaking facilities in the country." For more info, visit http://www.taborhill.com. Tabor Hill Winery & Restaurant in Buchanan is now featuring a Bloody Mary Bar in its Grape Escape Lounge on Sundays, noon-3 p.m. For more information, visit http://www.taborhill.com. Cascade Winery in Grand Rapids hosts a weekly pasta dinner, 5-7 p.m. The cost is $12 for a built-to-order plate of pasta and the first glass of wine or 12 oz. beer. For more information, visit http://www.cascadecellars.com. The Village at Grand Traverse Commons — home to Left Foot Charley and TASTES of Black Star Farms, along with various other retailers and eateries — is featuring art, food and drink samples, shopping, dining and salon specials, live music, demos and more on the first Friday of each month, 5-8 p.m. For more information, visit http://www.thevillagetc.com. Left Foot Charley in Traverse City has declared Monday Open Mic Night. Patrons are invited to share their talents or just come enjoy the show with wine and cider, 6-9 p.m. For more information, visit the Facebook event page: http://www.facebook.com/events/368792629875572. Sandhill Crane Vineyards is staying open late Thursday nights to host live music at its new café/event venue. Music runs 6:30-8:30 p.m., and an expanded café menu is available. Admission is $5 and includes wine tasting. For more information, visit http://www.sandhillcranevineyards.com. Enjoy dinner in the elegant Arcturos dining room at the Inn on Black Star Farms in Suttons Bay. The Inn chef embraces a philosophy of cooking with meats, herbs, vegetables and fruits grown/raised on the farm at Black Star or from other Michigan farms located within a 100-mile radius. An assortment of in-house-prepared decadent desserts also is available, and Black Star Farms wine is available by the glass or the bottle. Seating is limited; reservations are required. Dinners begin at 6:30 p.m. Call (231) 944-1251. For a list of upcoming dates, visit http://www.blackstarfarms.com/inn/event-calendar. Sandhill Crane Vineyards in Jackson is offering Knit & Sip nights on the first Thursday of every month, 6-8:30 p.m. Coinciding with the winery's Thirsty Thursday events, the Knit & Sip nights allow knitters, crocheters and spinners to listen to music and order from the café if desired while performing their craft in the banquet room, where they can chat as they work. There is no charge for admission. For more information, visit http://www.sandhillcranevineyards.com. Bad Bear Brewery, located at Sleeping Bear Winery in Albion, will host karaoke parties, 6:30-9:30 p.m., on the first Friday of every month. For more information, visit http://www.sleepingbearwinery.com. Sandhill Crane Vineyards in Jackson hosts performances by local piano man Paul Schmitt on most Sunday afternoons, 2-5 p.m. For more information, visit http://www.sandhillcranevineyards.com. 2 Lads staffers will explain the what, where, why and how behind the winemaking process during private tours and tastings of the Old Mission Peninsula facility. Participants can tour the crush pad and get an in-depth look at how wine is made and what sets 2 Lads apart; visit the barrel room and learn about red wines and the aging process; and taste 2 Lads wines paired with a premium food plate in the private gallery. The tour/tasting lasts about an hour and a half and is by appointment only. The cost is $25 per person. For more information, call Caryn at (231) 223-7722. Relax and celebrate the end of the week with Wine Down Fridays at Baroda Founders in Baroda. The event runs 5-8 p.m. For more information, visit Founders' Facebook page: http://www.facebook.com/pages/Founders-Wine-Cellar/333830355636. Get a plate of ethnic food prepared by Chef Kristin Karam of K2 Edibles & Events and a glass of Left Foot Charley wine or hard cider for $15 every Thursday, 5-7 p.m., at LFC. (Food also is available for $12 without wine or cider.) A different part of the world is featured weekly; selections have included Mexican, Cuban, Cajun, Indian and Lebanese. Reservations are not required, but plates are limited, and only available while the food lasts. For more information, call (231) 995-0500. Grill ham, sausage, potatoes, bread, fresh veggies and apples, drizzle them with raclette cheese from Leelanau Cheese Co., and enjoy alongside wine samples — almost a full bottle — and you've got yourself a Matterhorn Grill dinner at TASTES of Black Star Farms, located at the Village at Grand Traverse Commons in Traverse City. Dinner for two is $50. Seatings are 6-7:30 p.m. To reserve a table, call (231) 944-1349. Fenn Valley Winery in Fennville offers extended 1 hour, 45 minutes tours that include wine tasting for $8 per person, which includes a logo glass and a coupon for $5 that can be redeemed toward the purchase of four or more bottles of wine. In the winter and spring months, the tours go into the wine cellar and focus on winemaking and cellar practices' influence on wine styles/flavors. In the fall, the tours venture into the vineyard, placing emphasis on grape growing and outdoor operations. Summer tours feature "a little of both." In the fall only, shorter "standard" vineyard tours also are available; they are $5 per person and include a logo glass and more limited wine tasting. No children under age 2 are permitted. For more information, visit http://www.fennvalley.com/winetour.html. Bowers Harbor Vineyards on Old Mission Peninsula offers vineyard tours by request. The cost is $25 per person and includes the tour, bubbly, cheese and crackers or whitefish pate, and a flight of wine. To schedule a tour, call (231) 223-7615.